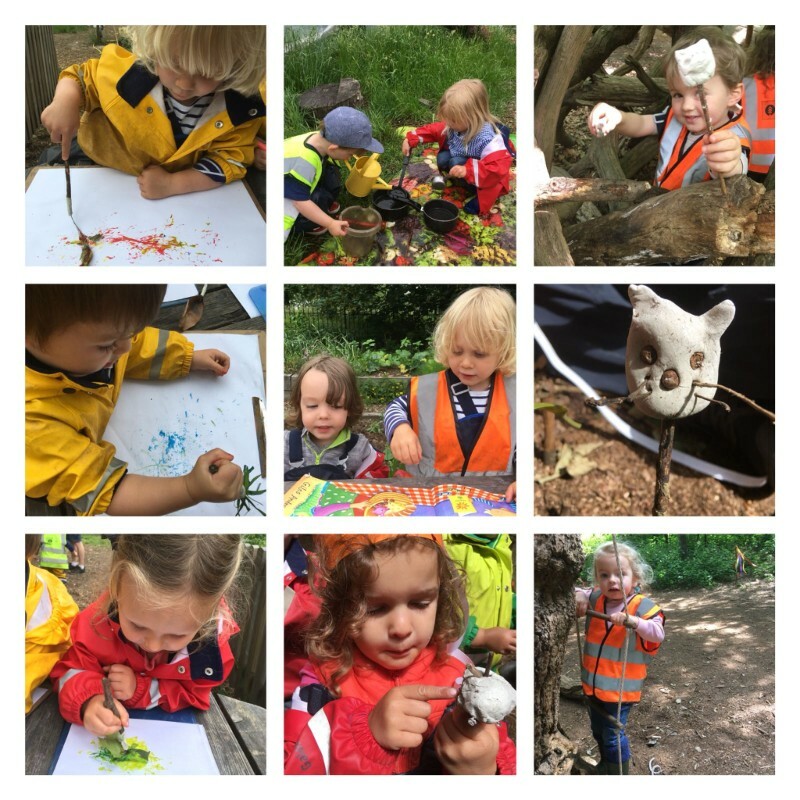 It has been lovely to welcome back all of our friends from half term this week and as well as doing regular climbing, exploring and foraging, we have been using some new materials on site which the children have really enjoyed getting their fingers stuck into…literally. The children always love making mud pies or cakes for their friends. Sometimes they even like to make mud faces on the trees around them using a concoction of water and dirt to make a nice oozy mud. With it being so dry recently it has been hard to consistently make the same really good building mud. So, this week the clay has been a great alternative. After some squeezing, smoothing and rolling exploration we then explored our interest in numerals and sculpted numbers all the way from 0-9! The next day we started to explore the clay again and how we could use it to make forest puppets (on the end of sticks) and characters for our story. We had some wild characters - a grumpy cat who spun around to show he was then happy, a 7-eyed monster and a talking spaceship! The children have also really enjoyed scavenger hunts this week, taking their time to collect the items they can see on their scavenger lists. After returning with their array of pinecones and a selection of leaves the children set about measuring their objects. Using a tape measure the children took turns to see how long their pinecones were. Holding the tip at 1 and counting the numbers until the end of the pinecone – the children then laid out their pinecones in size order. Further mathematical exploration followed when we spent some time collecting sticks and using twine to combine these to make 2D shapes. The Little Forest Folk-ers were incredibly focused as they weaved and knotted their shape into place. There was lots of discussion around how many sides each shape had and some really creative thinking when they spotted that the sticks could be manipulated to create new shapes - a square losing a side and turning into a triangle – “Now there are just 3 sticks!” they exclaimed. Have a really lovely weekend everybody, see you next week!